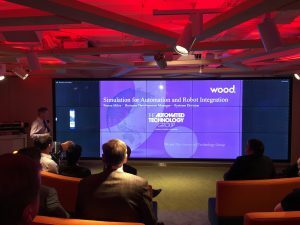 Representatives of The Automated Technology Group and its parent, Wood, recently participated in the Robotics Week organised by the Oil and Gas Technology Centre (OGTC). Taking place at the OGTC’s state-of-the-art Innovation Hub at its premises in Aberdeen, Robotics Week aimed to bring together experts from industry and academia to explore and accelerate the use of robotics offshore. 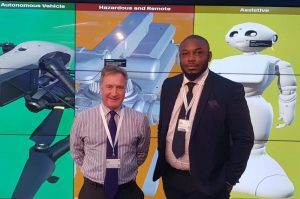 Simon Miles, Business Development Manager for ATG’s Systems Division (pictured, left), attended the event, accompanied by Temitope Solanke, Wood’s Regional Manager, Process Solutions (right). 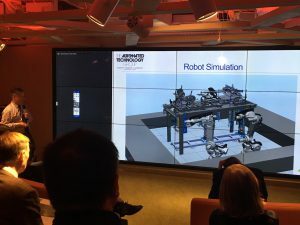 Robotic technologies are in demand for a wide range of tasks in the oil and gas industry such as inspections or measurements of pipework, analysis of structural integrity, leak detection and heat measurement. The OGTC was established in 2016 with funding from both the Scottish and UK governments with the objective of enhancing growth, competitiveness, infrastructure and employment in the region through investment in projects that help to unlock the full potential of the North Sea.